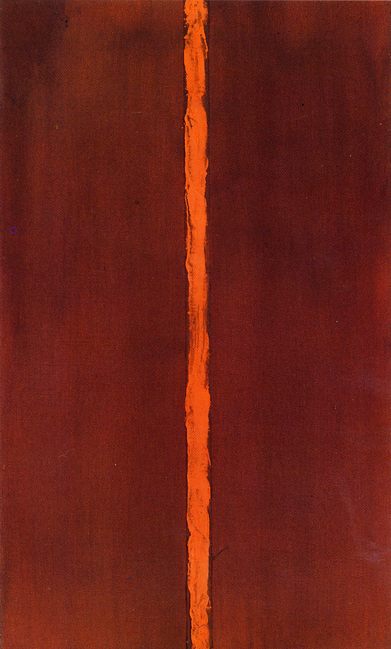 The first time I saw Barnett Newman's Onement 1 (1948), I voiced in abject perplexity, "what is it?" Little did I know that this was precisely the question Newman wanted me to ask, so he could answer, while stifling a chuckle, "it is...what it is." Well, sort of. He might have said something more along the lines of wanting his viewers to "begin in the ‘chaos’ of feeling and sensation…to evoke out of this chaos ‘a memory of the emotion of an experienced moment of total reality,’” (Rosenberg, Harold. 1972. The De-definition of Art. New York: Macmillan Publishing Co. p93). Um, yeah... Basically, Newman was driving at the issue that can divide art camps when asking that fundamental question, "what is art? ", the definitive answer to which is most elusive. 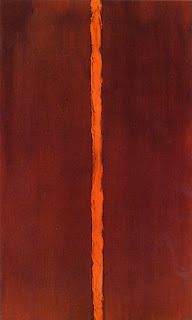 For Newman, painting a copy of something that exists is exactly that - copying something that exists. Copying does require degrees of skill, and the more realistic the copy, the more skill that's required. Wonderful...just not very creative. To "create", opined Newman, was to, as it were, become like God, who created things that had not existed before they were created. Humans, made in "the image" of this creative Creator, were thus expected to be reflections of this creativeness and likewise not just create, but be creative (Newman drew heavily from his Jewish heritage as well as his education in philosophy). As such, a vase of flowers or a bowl of fruit didn't excite Newman. Nor did he want a viewer to look at Onement and try and recognize something else by which to make sense of it. If someone was able to answer "it's a tree" or "it's the horizon at sundown", he'd have failed, for indeed his work would have had meaning only as it reflected something else, something he did not himself create; that piece would not have brought the viewer any closer to the creator of the piece, but instead to the creator of the horizon, which certainly wasn't Newman. When I first saw Onement, it made me think "what in the world is Newman trying to say?" It became the beginning of a journey of discovery, an invitation to begin a dialog with the artist, through which I might become more acquainted and, yes, even intimate with his deepest ideas about art, life, his place in the world, and mine too. It is what it is - a unique creation, from the mind of a unique artist, who had something to say. It got my attention. I was listening. I heard him. Of course, "art", for such a short word, is a very big idea. And surely many will disagree with the notion that copying isn't "really art," which is fine. Defining art is a very personal experience - to share one's findings is itself a part of the motivation for artists to produce and engage. I explore not only the issue of defining art, but my definition of art, in my book The Essential Artist. (I welcome any comments on the manuscript while it's in the "read it for free online" vetting phase - http://www.scribd.com/doc/33684335/The-Essential-Artist). One of the primary lessons I learned from Onement 1 is simply this: appreciating artists and their art may require that we push past the surface - the "what it is" - to contemplate and approach the "what it means." Perhaps even asking "what does it mean" is asking too much of it (art). Perhaps allowing it to simply ( or complexly ) be beautiful for beauty sake is enough. The Essential Artist is an in-depth and interesting perspective on the art and artists it examines. There is something alluring about boundary pushers and those determined to be heard. For me, art is more about feelings rather than interpretation, however, I enjoyed being taken on this exploration of meaning. Combining insight into the emotion of works for which I am already familiar, made this journey much more powerful.